Monnit founder and CEO, Brad Walters, was featured in an article by Businessweek discussing the issues of hiring and working with family members. Using wireless sensors to monitor the temperature and humidity in greenhouses. Plants require the proper environmental conditions for optimal growth and health. If the mixture of temperature and humidity are incorrect, fruit and vegetable yield can be affected. Monnit can help you monitor and maintain the optimal mix of environmental conditions for plant growth. With Monnit WIT Wireless Temperature Sensors and Wireless Humidity Sensors you can have 24/7 monitoring of your greenhouses and have the ability to track environmental changes, allowing you to maximize your energy efficiency and grow healthier crops with a higher yield. Now you can make fewer assumptions and minimize mistakes when balancing the environmental conditions within your greenhouses. « View More Information. 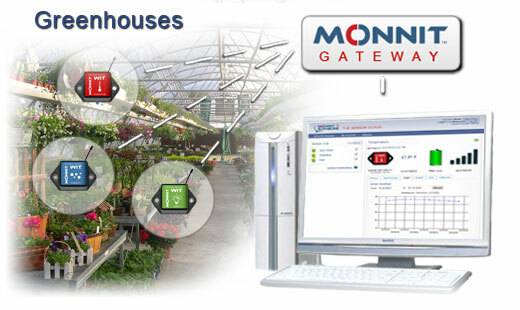 Maximize Your Greenhouse Efficiency with Monnit Wireless Sensors. When placing Monnit wireless sensors, you want to make sure that you have a reliable transmission signal between the sensor and the MonnitLink Gateway. If the signal is too weak you risk having important sensor data missed as well as decreasing the battery life of your wireless sensors due to transmission retries. Monnit provides a great wireless sensor product that can aid in the process or placing wireless sensors around your building(s). The Monnit Wireless Button Sensor can provide you with a way to test the transmission signal from your desired sensor location before permanently affixing another wireless sensor at that location. The button sensor includes an LED indication system allowing the user to understand the signal quality of a sensors location before mounting. Put the button sensor in the exact location where the other sensor will be mounted, then press the button. The light should blink green if the sensor has transmitted successfully. If the light flashes red, press the button again to double check the location. If the light blinks red again, you will need to find a different location for the sensor you wish to place. For a better understanding of the signal quality, log into the iMonnit online system or Monnit Express Software on your computer to see the visual display of signal strength. Here is another handy trick. Log into the iMonnit online system from any web enabled smart phone, so you can check the signal quality without having to return to a computer. We hope this little tip has helped you understand how you can optimize the placement of your wireless sensors. For more tips on using your wireless sensors or software, please visit the WiSe Guys Tech Tips.